Spring is full of brilliant colors. The colors are joyful, vigorous and cultural. 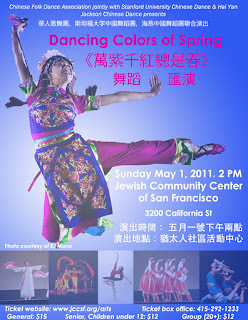 The “Dancing Colors of Spring” is to bring these radiant colors through Chinese folk dancing. The Chinese culture is a vivid array of people and traditions. “Dancing Colors of Spring” is a proud collaboration performance by the Chinese Folk Dance Association (CFDA) with Hai Yan Jackson Chinese Dance and the Stanford University Chinese Dance. 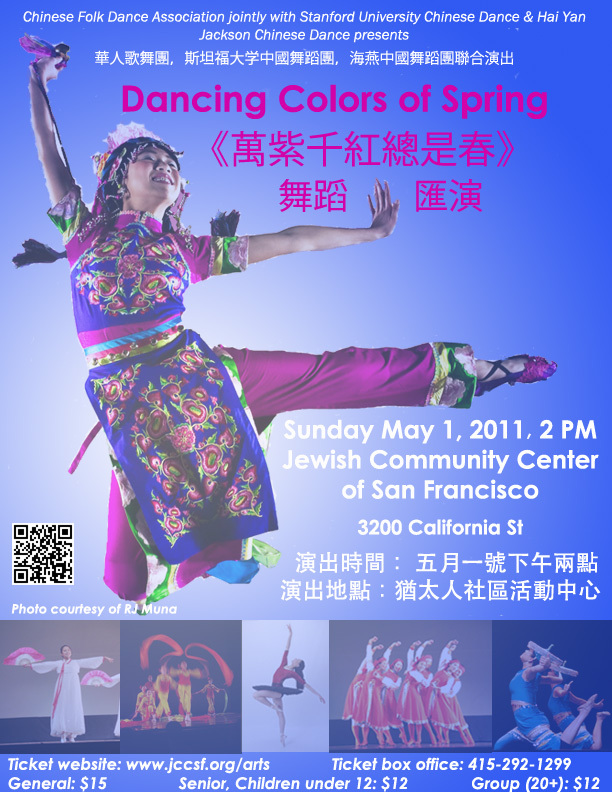 Chinese Folk Dance Association of San Francisco is a 52 years veteran dance organization. It is the oldest non-profit Chinese folk dance company outside of China and is delighted to showcase fresh looks and new dances, with Hai Yan Jackson Chinese Dance and the Stanford University Chinese Dancers, to continue the promotion of China’s rich and diverse inner cultures. Please join us in San Francisco to celebrate colors of spring on Sunday, May 1st, 2 pm. Thank you for your patronage. As a professional dance teacher for more than 30 years, I’m excited to announce that my dancers and Chinese Folk Dance Association, Stanford Chinese Dance are hosting a collaborate performance on Sunday, May 1st at the Jewish Community Center of San Francisco, 3200 California Street, San Francisco. This will be very exciting event.